The Kensington Oak Cut string Staircase - Classic Cut String Saircase construction designed with simple stop chamfered stair balusters - Simple contemporary quality oak staircase. The Kensington White Oak Cut string staircase brings contemporary styling to the traditional cut string staircase. Constructed with a Cut and mitred stair string detail with traditional return nosings with not to much fussiness with the usual decorative brackets. Balustrade constructed with Stop chamfered newel posts and balusters from the Stairplan select oak range gives simple clean lines. A Curtail Entry Step at the base of the staircase adds a touch of detail whilst also ensuring the bottom newel post remains completely rigid. 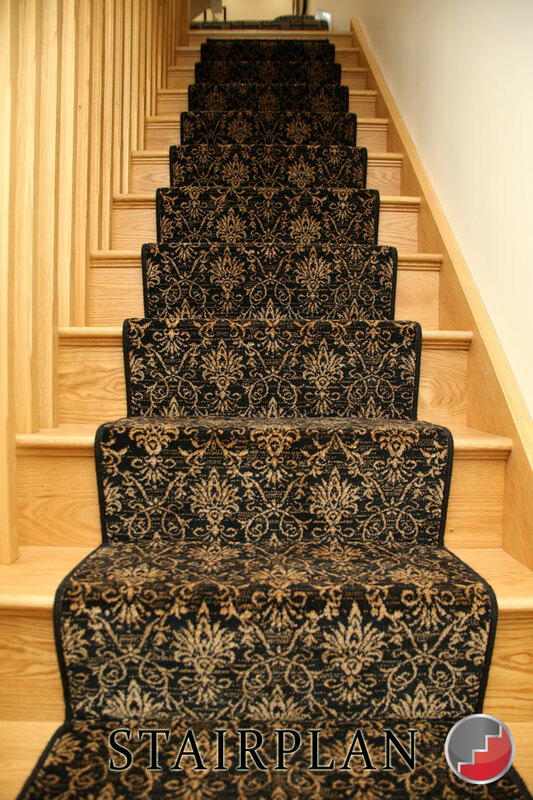 Here you can see looking directly up the stair with a carpet runner in black with a gold coloured leaf pattern. 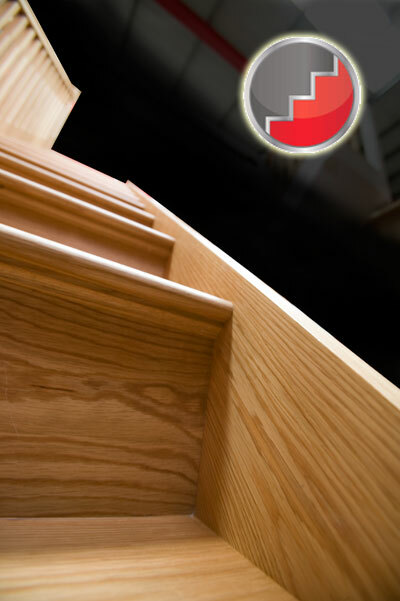 This detail gives you a closer look at the detail and craftsmanship in the staircases cut string construction. 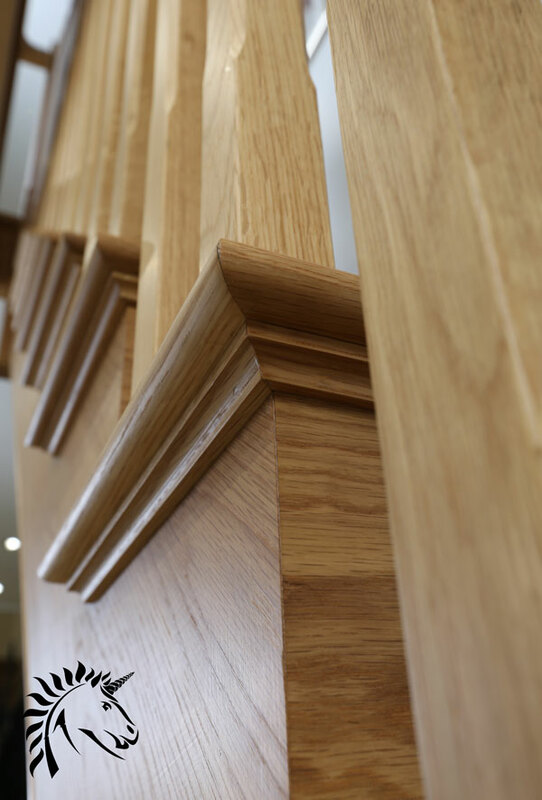 Solid Oak Riser mitred to the Cut String section, no decorative bracket or corner mould to hide the joint, Return nosing and scotia detail. Above this was a picture of the kensington stair prior to installation with the background blacked out. 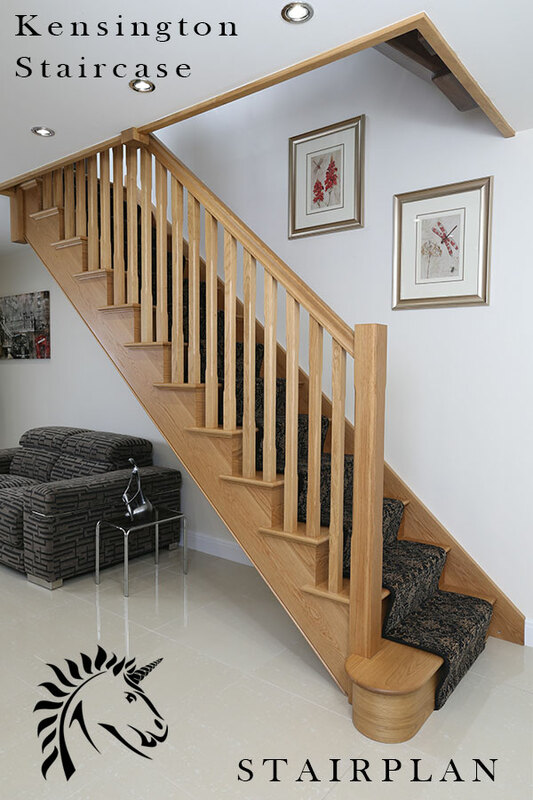 Solid oak risers are a standard feature with Stairplan's cut string staircases. What is Cut String ? 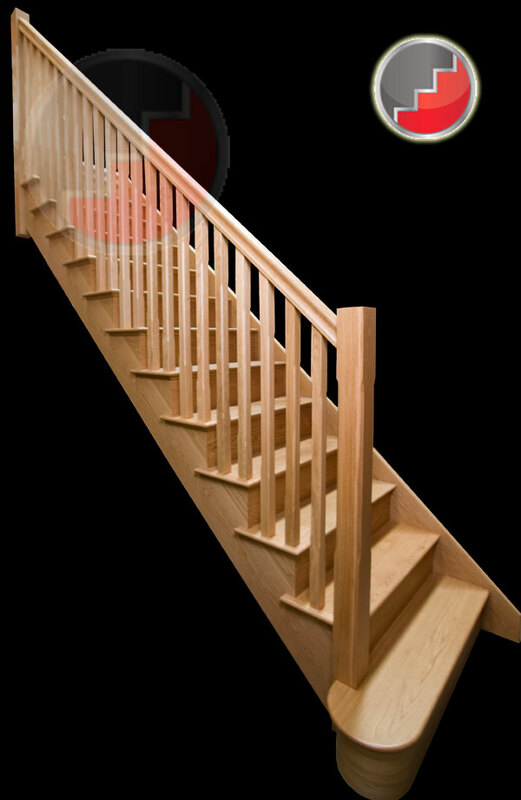 A solid oak riser offers more character than a veneered stair riser. 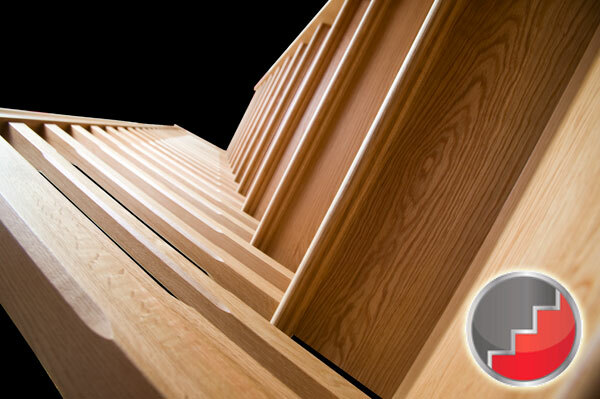 Here at Stairplan we specialise in the manufacture of wooden staircases, Cut string staircases like the Kensington are one of the areas where we are class leaders in this industry, the cut and mitred string requires high levels of skill to give a high quality finish, and on these you will see a clear advantage in the staircases produced by Stairplan in comparrison to our competitors efforts. 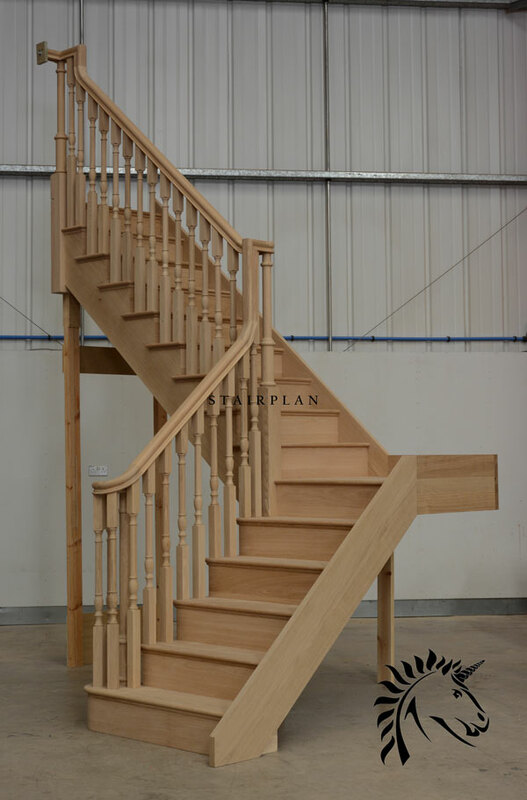 In our showroom and design and development centre we have a number of cut string staircases on display.